Allen Hurns has been an amazing find by the Jacksonville Jaguars. Fighting his way up a decent roster of receivers and draftees, Hurns has emerged as one of young quarterback Blake Bortles consistent targets. Allen also forms with Allen Robinson to be one of the most potent duos in the league at that position. In 2014, he played more of a split end for the Jags catching 51 passes for 677 yards and 6 TDs. He’d break the 1,000 yard barrier in 2015 on 64 receptions, while hauling in 10 TDs, including an 80 yarder in 2015. All the more impressive, Allen also set the team record for most consecutive games with a TD reception (7). 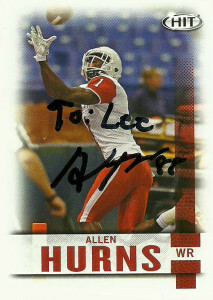 A track and football guy in college at The University of Miami, FL, Allen set the single-season school record with 1,162 receiving yards in 2014. Hurns slipped through the draft unnoticed and was considered a 7th round pick or a priority free agent by many teams. His tape really didn’t do him justice, but it didn’t help that he was running so many short to intermediate basic routes. Being so nearby to Jacksonville, it made sense that the Jaguars take a flyer on him. I don’t have that many Jaguars in my collection, something I’ve been slow to rectify. This is partially due to the fact that they joined the NFL after I had stopped collecting in the 90s and that they are considered a division rival. Still in the last few years, I have flirted with the Jags. I really like what they’ve done offensively to open things up in the last 2-3 years, and I make no secret that I think that Blake Bortles is one of the best QBs to come along in the last few years. 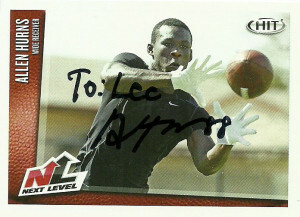 I went ahead and took a shot at Hurns and he signed and personalized these two cards in a pretty short amount of time.